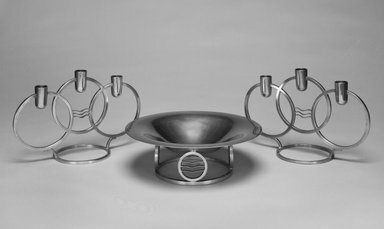 "Classique Modern" Candelabrum, pewter (one of a pair with 1993.78.3). Three overlapping rings with square profile raised on two short arched supports from circular base. The two outer rings connected by three flat, waving bands. Elongated cylindrical bobeche with rounded bottom at center top of each of three overlapping circles. CONDITION: Very good condition.